At least 12 people have died of dehydration and exhaustion while sitting in traffic in Indonesia. 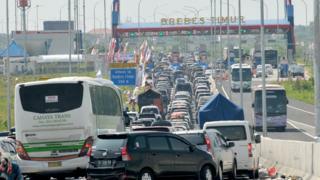 Traffic filled up three lanes for several days on the island of Java. Crowds travelling to their home villages to mark the end of the holy month of Ramadan converged around a single traffic junction, where building work forced them to wait. Most victims were elderly and died in hot cars, officials say. One toddler was poisoned to death by exhaust fumes. Daytime temperatures in the city of Brebes, where the jam occurred, have been close to 30C (86F) all week. The authorities have set up a hotline for stranded drivers to call in a medical emergency but correspondents say it is unclear how help would reach anyone in trouble. Transport officials said the deaths happened between Sunday and Tuesday. The traffic jam was more than 13 miles (21km) long. "There's no space on the road," transport ministry spokesman Hemi Pramuraharjo told the Agence France-Presse news agency. "We don't have a solution." The Indonesian health ministry said people who were planning a long car journey should rest along the way and take necessary precautions. Local media reported that roads in to the capital Jakarta are expected to be busy over the weekend as people return from the Eid al-Fitr festival that marks the end of Ramadan.